Broad Oak Primary School Dances to Victory!!! 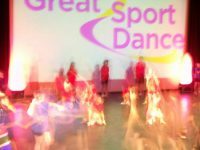 A huge well done to all 33 of our SUPERSTAR dancers who took part in the 2011 Great Sports Dance event last week. Not only did they win their heat of the competition but they were also selected as the overall winners of the whole competition. The children worked incredibly hard on their dance based on observations from sport. They showed tremendous skills and dedication and their timing and coordination were perfect. Colin Jackson, world record holder and Olympic medal holder for the hurdles came to school last Wednesday to present the dancers with their trophy in front of the whole school.